Alter Ego 105 : TwoMorrows Publishing, The Future of Comics and LEGO™ Publications. ALTER EGO #105 proudly presents "Tales from the Code!" 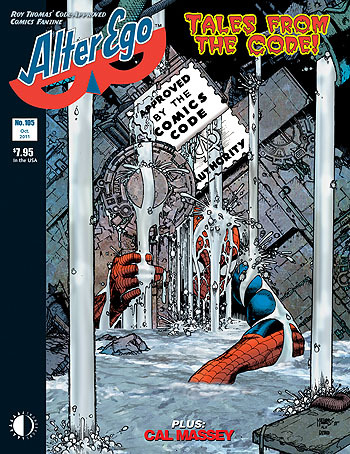 The coming of the Comics Code Authority in 1954-55 changed comics greatly—and we document that process with comic art and script "BEFORE" and "AFTER" the CCA got hold of them, with art by SIMON & KIRBY, DITKO, BUSCEMA, SINNOTT, GOULD, COLE, STERANKO, KRIGSTEIN, O'NEIL, GLANZMAN, ORLANDO, WILLIAMSON, HEATH, and many others! Plus: FCA ("Fawcett Collectors of America") with MARC SWAYZE & ROY ALD, MICHAEL T. GILBERT exploring more comics history in Mr. Monster's Comic Crypt, BILL SCHELLY on early comics fandom, JIM AMASH's interview with Timely/Atlas artist CAL MASSEY, and more! Featuring a fabulous new Spider-Man cover by JOSH MEDORS! Edited by ROY THOMAS.